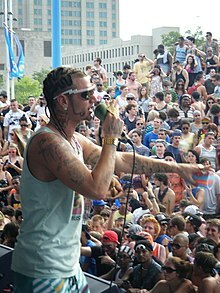 Horst Christian Simco, better known as Riff Raff, is a rapper from Texas. He joined the band The Neighborhood in 2013. His second album Neon Icon is going to be released by Mad Decent in January 2014. 2 Chainz, Drake, Snoop Dogg, and Juicy J worked on the album with Riff Raff. ↑ Mlynar, Phillip; Mlynar, Phillip (15 November 2013). "Riff Raff Has 10 New Songs Coming Soon". ↑ Cooper, Duncan (July 10, 2012). "Riff Raff's Surprise Album The Golden Alien Is Out Now". The Fader. ↑ "iTunes - Music - Jumpin' out the Gym by Riff Raff & DollaBillGates". Itunes.apple.com. 2013-04-29. Retrieved 2013-08-25. ↑ "Riff Raff & The Lean Team - Purple Haze & Hand Gernades Hosted by @DJJoeyDNC // Free Mixtape @". Datpiff.com. Retrieved 2013-09-23. ↑ "Riff Raff - Summer Of Surf Hosted by Dj Fletch // Free Mixtape @". Datpiff.com. 2012-06-29. Retrieved 2013-09-23.